UWE ROSLER has professed his delight at the capture of big-money recruit Chris Wood – and readily admits he did not think it was possible. 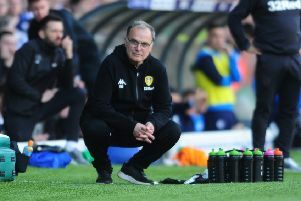 The Kiwi striker has arrived at Leeds for a seven-figure fee which could rise to £3m, with the Whites head coach quick to pay tribute to owner Massimo Cellino for sanctioning the deal and making it happen. Only last week, Rosler alluded to United not having one of the biggest budgets in the league, with little likelihood of big-money deal seemingly on the horizon. But the green light was given to recruit Wood, much to the head coach’s pleasant surprise. Rosler said: “The deal is a big one and we won’t be able to do two or three of them. I didn’t realise this (Wood signing) was possible – when I compare our wage budget to others. And our wage budget is what I was told last week. “But with the help of Mr Cellino, it has happened. Wolves were also interested in Wood, who has enjoyed success in the Championship with the likes of Millwall, Leicester and Birmingham, but ended their interest on Tuesday evening, viewing a £3m package to be too steep. Leeds had already pretty much signed and sealed the arrival of Wood, but both Rosler and the forward have been quick to stress that his arrival at Elland Road was down to footballing reasons and nothing about money. Rosler added: “There was other competition (for his signature). I know Wolves were interested and another club. “But I can only tell you what Chris told me when we had a meeting to present ourselves to him, his parents and agent. At just 23, Wood has already played for eight clubs in England, including six on loan and Rosler is confident he can lay down some lasting roots at Leeds and kick on again after being on the periphery at Leicester last term. On Wood, who spent a spell at Ipswich Town at the end of last season, he added: “He found it hard to get regular playing time (at Leicester) and got loaned out here and there. “Sometimes it is hard and you need stability in your day-to-day regime. Also with the players you play with and the manager and coaches you work with. “I think it will make it easier for a young player to settle.